Welcome to the Digital Age. During 2014, we were introduced and exposed to many new ways to stay connected and live simpler with brain mapping, 3-D printing, and new mobile collaborations. We predict 2015 will be no different, technology will continue to rise and impact our everyday lives. Below are a few trends we anticipate will be happening (or at least hope to see!) this year. Wearable Technology is on the rise, and it’s not going to stop at watches. Clothing and jewelry will appeal to the “always-connected” consumer. Technology is more than just at your fingerprints – but on any part of your skin – it will likely change how consumers utilize the technology available. 3D Printing is awesome! We’re hopeful that this will become a greater used resource this year. With the creation of 3D printing pens, this could be huge for agency life. 3D pens work similar to hot glue guns. The pens contain an electric heater that melts plastic, which quickly cools and solidifies into a strong stable structure. Our designers would have the potential to draw and create ideas for clients on the spot, leaving them with a tangible idea to hold onto. 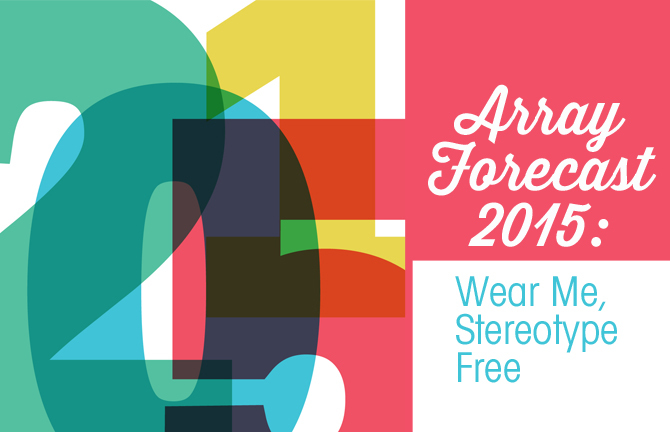 Breaking gender stereotypes will continue to rise in 2015. Consumers are abandoning gender-based purchasing behavior and companies are catching on. According to Mintel, “in the US, women aged 18-34 are more likely than men in the same age range to buy tickets to live sporting events and branded merchandise relating to their favorite sports.”* This year people will embrace themselves and what they want, despite what is the social norm. More attempts at the “Viral Video”. The interesting thing about this trend is that you can’t force it; you can put all your money into making an awesome video, but you won’t have any guarantee of a viral windfall. Everyone wants an ice bucket challenge, but it doesn’t work that way. The Ice Bucket social media trend, brought a 1000% increase in ALS donations. The activity of dumping a bucket of cold ice water on your head took over our newsfeeds. ALS causes muscle spasms, loss in muscle mass, difficulty speaking and breathing, and paralysis – and the challenge was intended to briefly experience what the people go through when submersed in ice water. Take some weight off your shoulders. We predict that mobile wallets will gain a lot of interest this year. Ericsson consumer trends for 2015 state that, “80% of consumers believe that the Smartphone will replace their entire purse by 2020.” Though mobile wallets have their advantages, we worry about complete protection— a computer hacker might be able to pickpocket me, but if my wallet is on my phone, that’s a different story. It would be nice to think that we could go wallet-free, but we’ll wait a little bit on this trend! The Digital Age is upon us and we’re ready for the year ahead. Whether it is one of the trends above or a new product innovation that has yet to be released – we’re excited to see the advances in communication and the new ways to gather and use information.